Happy Friday! It’s time for my blog feature, Building Character in which you get to meet a character from a book. Talking to a character outside of their book is fun! Huge. Amounts. Of fun. This week Strands of Thought plays host to a character from Sweet Sleep. I’ve been looking forward to this for a long time. Why don’t you introduce yourself, please? Nice! A man of few words. It’s great to meet you Frost. Can you tell us more about your story? Like, what conflict are you up against? I’m a thousand years old. The love of my life had her memory wiped. I finally fall in love again and the chick is already dead. It’s a little bit funny. Funny. Huh. That’s an interesting way to put it. What are some of the biggest stumbling blocks you’ve encountered trying to resolve your conflict? Well, it’s not really necrophilia. This prophecy says she’s going to be absorbed into her twin. Two souls becoming one. Her twin sister is in love with someone else…it’s complicated. Indeed. What have you learned about yourself, friends, or family while trying to work your way through this? My moral compass has always been a little bit off. Pretty much anything goes. I’m not shocked by my behavior. I guarantee the rest of my clan never even flinched. Grey thinks my flexible morals are hilarious. Tell us about your best friend or a side kick. That would probably be Grey. He’s Scottish and Australian. It’s a long story. He doesn’t have a mean bone in his body. He’s a good guy. Funny as hell. He’s sleeping with my ex. It’s been a thousand years, if she has to make her way through the guys in the clan. She could do a lot worse than Grey. Grey’s job is to calm down Lexy. Grey is her handler. Lexy is clan Ankhs Dragon. In Clan lingo that means she’s an emotional Dragon and a warrior. She’s not a green scaly dragon. Grey, Lexy and Arrianna were the last ones to come back out of the testing. That was over forty years ago. Tell us more about you. What is your strongest personality trait? I have certain skills with women. I have the same skill set as Lilarah. I mean Lily, my ex whatever she is. That’s a story for another place and time. Yes, let’s keep this interview family friendly. Is there anything about you that people are always giving you a hard time about? How do you feel about it? Don’t hate me because I’m beautiful. That commercial used to crack me up. It’s how I feel on most days. Girls love me, even some guys. True love is unattainable for me. I’m a little bit bitter about that, but I manage to find ways to occupy my time recreationally. I’m afraid I can’t answer that one with a PG rating. Just kidding, I’m on a personal search for the world’s best burger. Also the world’s best pizza place. I love beaches and women with curves. I’m addicted to pizza and have the curves to show it, so we should get along just fine. What are your three favorite foods? Burgers, Pizza and Spaghetti. That was an easy one. In control of my own life. I want to be free. Mallrats, Super Troopers, All of the Porky’s and Police Academy movies. We tend to watch a lot of messed up funny shows, Zombie shows and Horrors. I loved the Harry Potter series, and anything by Stephen King. The second tiers (Ankh, Trinity, and Triad) we change the world every single day, but Mortals (first tiers) never hear about it. 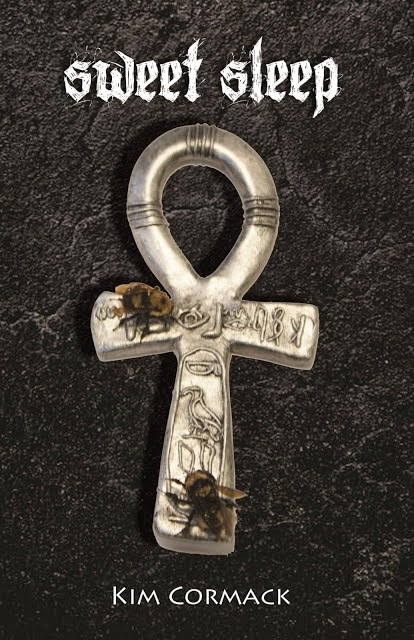 And finally, Frost of Ankh, what words of wisdom would you like to share with our readers? In the magical lyrical genius of Rascal Flatts, Life is a highway; I’m going to ride it all night long. Joking, that was a joke. I know what I want to say, Stand back up. When life kicks you down. Stand back up. A Thousand years ago the Correction began. The creation of new immortals became illegal. Under third tier law any human with an ability that uses it to alter a life path has committed an offense punishable by Correction. Any human sired by a third tier soul (immortal) must also be destroyed. They allow you to live until after your 16th birthday. You get a chance to fight back. They want you to fight back. You won't know they're coming. Be Brave for these are your final moments. Everyone in your genetic line must also be Corrected. Erased from the world like a spiritual virus. This is your Sweet Sleep. If you survive your Correction and awaken from your Sweet Sleep. You must join with the first clan that comes. Your miracle was not free. There was fine print to be read at the bottom of your contract. You have signed up for a second chance at life, as a sacrificial lamb for the greater good. You are on your way to the slaughter. This is not a fairy tale... This is a nightmare. Kim Cormack worked for 15 years as an Early Childhood educator in preschool, daycare, and as an aid. She has been blessed to live most of her life on Vancouver Island in beautiful British Columbia, Canada. She currently lives in the gorgeous little town of Port Alberni with her crazy little family. She is a single mom with two awesome kids, Cameron and Jenna. Cameron is eight years old and Jenna just graduated. Jenna wants to be an archaeologist and specialize in ancient languages. She is a lover of shenanigans and pranks and she often pulls off one or two a week, just because she can. She adores all that is wild and hilarious. Her home is full of laughter, and, if each day She can find a way to make just one person laugh so hard they have an accident, it was a day well spent for her. She spends most of her time parenting, creating hijinks, or disappearing into her own mind and journeying through other realms. She hopes when you read her books you laugh, you cry and then you step out of your box for a minute and notice the magic that is absolutely everywhere. On January 28, 2009, She traveled back to her childhood in a miraculous dream. She woke up in the middle of the night and typed a whole children’s book into her cell phone. It was a collection of first moments….being four years old and holding a baby chick. Then running on the beach and playing in the sand. She says she could remember so clearly how it all felt – So clearly she lived it all over again. Another time, she was on the B.C Ferries thinking about her son Cameron and the shark boots he’d been obsessed with for six months and the shenanigans he always blamed on the boots. It was the boots that wanted to roll in the mud or jump in the puddle. (Sharks apparently love the mud. She says she didn't know this little tidbit of information until she had a son.) As a result, she published her first children’s book, Shark Boots, in May of 2010. Her second book, Being Four, followed in 2011. She continued to write many more funny and strange children's books after these first two. Then one night She had another dream, only this time it was a nightmare. From that nightmare came an entire book series, a series that she has been eating, sleeping, and breathing since that very first sleepless night. When she awoke from the nightmare, she had a creepy song continuously playing in her head. She immediately wrote down all of the details of the dream to make the song go away. Yet the song continued to play…. 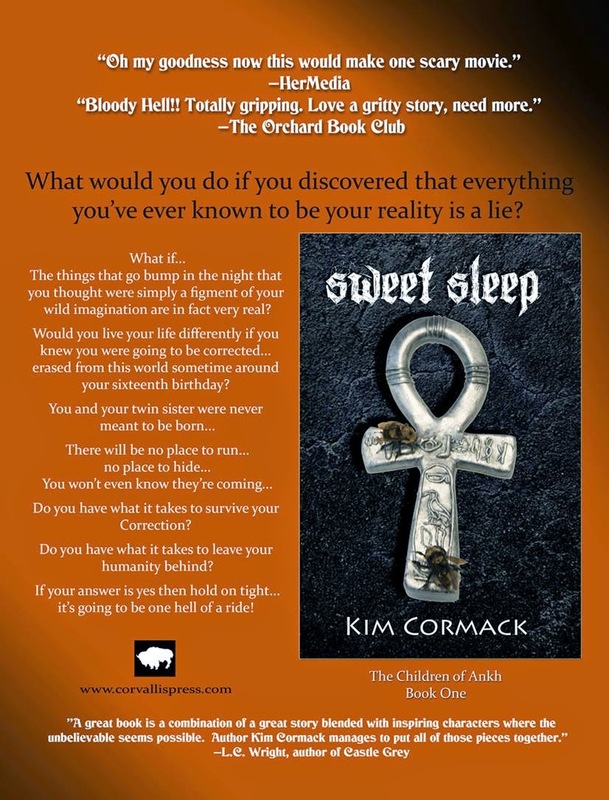 The result of this nightmare is her first YA book, Sweet Sleep, the first in her YA Paranormal Fantasy series, The Children of Ankh, Coming August 7th 2014 from Corvallis Press. She can't wait to share these characters with the world. Thanks for visiting! Yippee for your book.